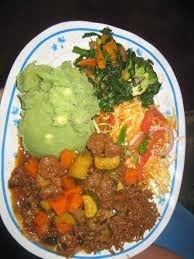 Mukimo is the staple food for the Kikuyu people in Central Kenya. It is cooked all year round and in important functions like the traditional weddings, circumcision ceremonies, and dowry negotiations and so on. There are two kinds of mukimo; red mukimo that is made with beans and green maize and green mukimo that is made with pumpkin leaves instead of beans. Most Kenyan hotels serve the green one. My grandmother used to make it red and I loved it so much. It would make a perfect healthy dinner recipe for 2. This is the recipe for the kind I normally see in hotels. It is green in colour. My husband comes from a different tribe and this dish is not what he is used to. He however loves it so much. When the water starts to boil, cut the pumpkin leaves roughly into small pieces and cover the boiling potatoes with them. You can use your hand to do this. Let the food boil till the potatoes are soft and the pumpkin leaves and cooked and marshy. Drain excess water and use a wooden spoon to mix the potatoes, maize and leaves together. To make the red one, boil the maize with the beans and do not use the pumpkin leaves.